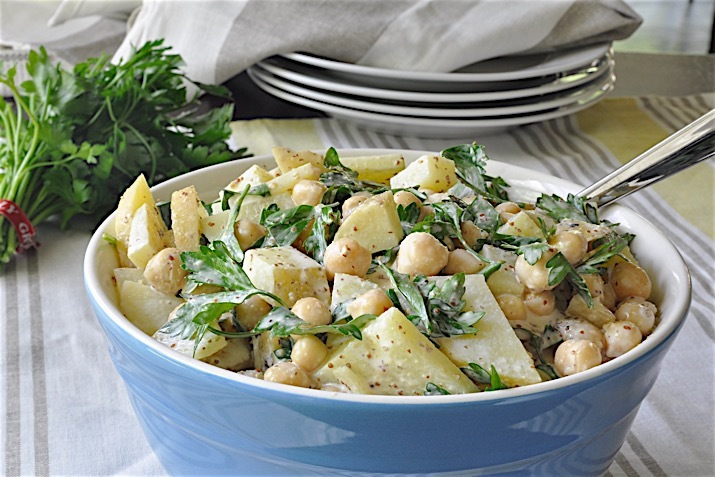 A tasty potato salad to serve alongside hamburgers, hot dogs or BBQ chicken! Place potatoes in large pot with enough salted water to cover. Boil until potatoes are just tender, about 10 minutes. Drain potatoes and rinse with cool water, allow to cool (see Tip). In a large bowl, whisk together the mustard, mayo and lemon juice. Season with salt and pepper to taste. Add garbanzo beans and parsley, toss to coat. Add potatoes and gently fold into dressing. Add additional salt and pepper to taste. Served immediately at room temp or refrigerate and serve cold (salad may be made one day ahead). Great salad to serve with hamburgers, hot dogs or BBQ chicken! Invite your kids to help with preparation. Have them whisk the dressing and fold in the ingredients.